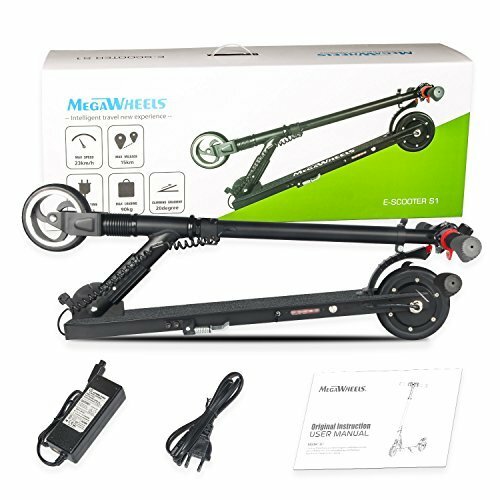 Today we are reviewing the Megawheels electric scooter which is a cheaply priced, lightweight scooter. We are at the moment on the hunt for the best lightweight and folding electric scooters. 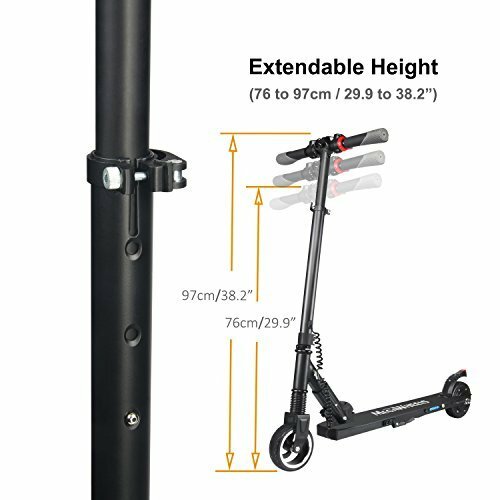 A scooter you can take with you anywhere. Many of these work as a last mile solution and rarely go more than 5 miles per charge. Let’s see if we’ve found a diamond in the rough here by dissecting it thoroughly. Who’s it for, why is it so cheap, and does it provide any sort of value to its user? 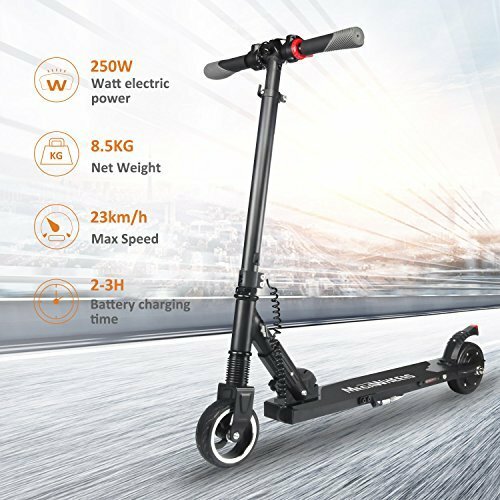 In order to answer those questions, we need to know how an electric scooter works and operates. Luckily we do and I say we just go straight into our full review. Megawheels is a brand I actually knew pretty much about beforehand. I have talked to one of their US managers and I know they started out with hoverboards and eventually went into electric scooters. From my previous knowledge, I know their products are good and that they have a good after sales department based in the USA. The Megawheels S1 is a budget electric scooter. At this price tag, you cannot expect to get insane performance when it comes to distance and speed. 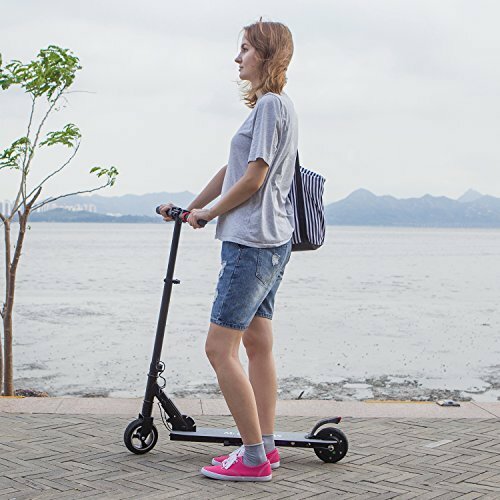 However, It should still provide a good quality scooter which is comfortable to ride and handles everyday use. I would say that with its 14 mph top speed and 5-8 miles range. Highly dependant on the user’s weight, it mostly caters to teenagers and by stretching it, even to lighter adults. If you have a bigger bone structure then I suggest going with something more durable and with a little more power underneath the hood. Nonetheless, the scooter’s design is very smart and I especially like the unique folding mechanism. 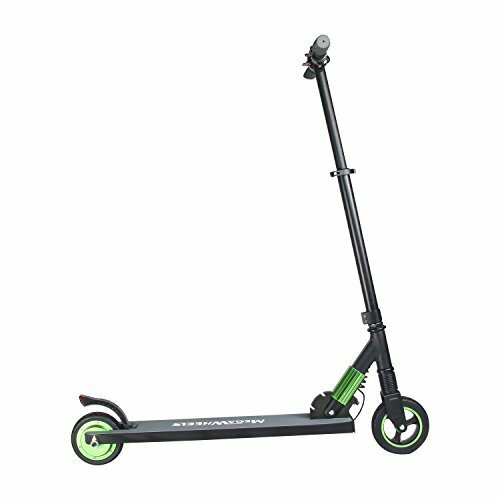 I have never encountered a folding mechanism that works the same way on any of the scooters I’ve previously tested. Easy to use and it enables you to adjust it, even if just a bit. 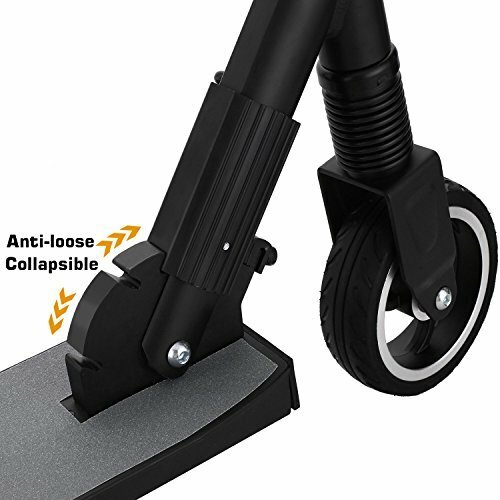 Combining that with the light weight of this unit I consider this to be an excellent choice as an alternative to the Glion Dolly. It might miss a few features here and there, but the fact that it has no LED-screen to read values off is a bit strange. However, there is a battery indicator mounted on the footpads left side, a peculiar placement I know. But you can actually see the battery level while riding, even though it’s not convenient at all. It’s definitely not the most powerful scooter we’ve reviewed but it does provide some value. The Megawheels S1 is a decent model if you're a teenager or kid and need a budget scoot. A teenager/kid with their lower weight will get a lot more bang for their buck. An affordable way to get your electric scooter toes wet. However, adults should keep on looking. Speed & Range: Top speed up to 14 mph; 5-8 miles range, 20° gradeability (Depends on the users weight). Super Light : Only 18 lbs weight, convenient for you to bring it to by buy or metro. 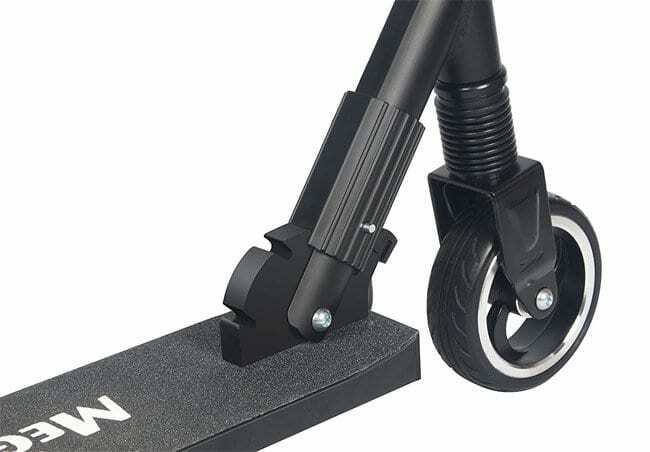 The Megawheels S1 scooter has a handlebar that is adjustable in height. This isn’t too common for electric scooters. It does help with broadening its audience now that tall and short people. For example, adults and teens, can both ride the same scooter without feeling weird. The ride is smooth enough for the money you have to pay and the concealed front shock does help a little in reducing bumps from the 5.5” solid rubber tires. Most other scooters come with a headlight, but the Megawheels S1 only have a tail light. Therefore, I suggest you purchase one of these cheap LED-lights and mount it on top of the handlebar to increase your visibility during the darker hours of the day. Going up the hills of my neighborhood wasn’t as fun as riding on the flat surface. I had to help it up the steeper hills and I could feel the juice run lower and lower while going up a long 8-degree hill. 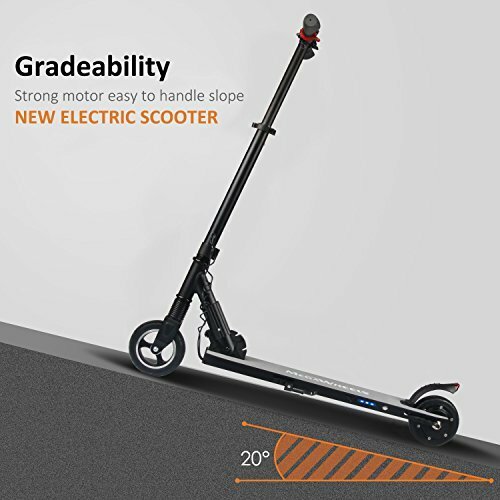 But still, at this price, there is no scooter that handles inclines well. If you are going to ride a lot of hills you’d be better off paying 3-5 times as much. When battery level falls below 50% I could feel it slowing down pretty dramatically. The acceleration also suffered a lot at lower battery levels, at around 1 bar it was barely fun anymore. For this price, I think it provides a decent ride for those looking to get around campus, getting to work just a few miles away, or as a last mile solution. I can see a teenager get a lot more out of it looking from a weight perspective. I thought it was a fun ride even though I weigh 176 lbs and it did get me around fairly easy as long as there were no inclines. A Lightweight scooter that even a kid can handle. Good mechanical brakes and the footbrake works fairly well too, a combination of both is a must if you need to slow really fast. 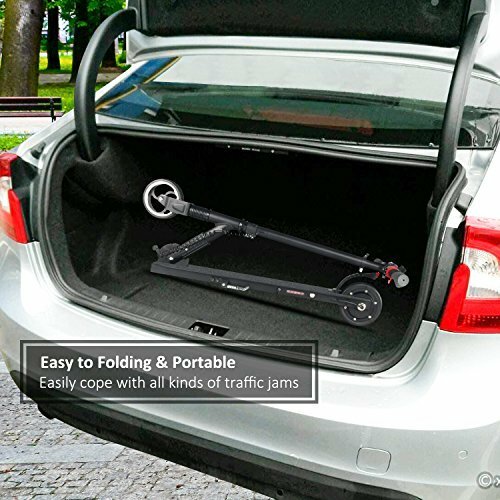 It folds together very easily and becomes very compact. You can adjust the handlebar in three different heights. A concealed front shock that helps absorb bumps and uneven terrain. 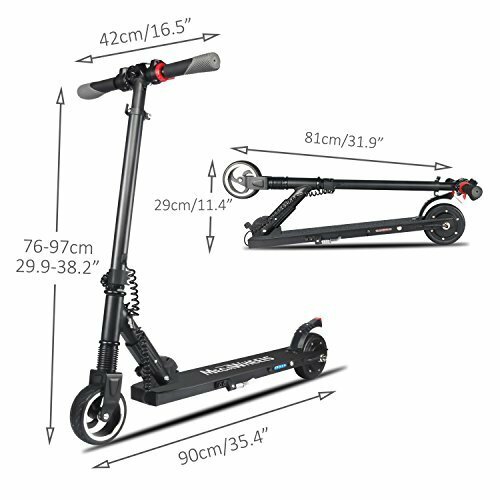 I would definitely recommend the Megawheels S1 electric scooter to someone on a budget. Perhaps an adult or teenager who is more looking for a fun ride less than an alternative to taking the car. You get a good mileage out of it compared to similar items on the market and it doesn’t overpromise. It delivers what we expected, nothing more, nothing less. 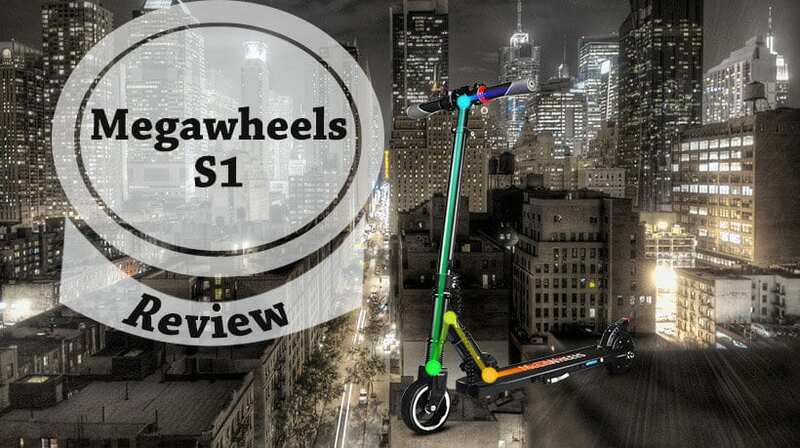 I would recommend that you check out the Segway es1 review we did a while back and compare it to this one. Price is just a couple of dollars higher but you get a lot more features and better performance. There is even an add-on battery pack for an extended range that’ll help if you’d want to evolve your riding later on. A great last mile solution, campus get-around, or perhaps for a quick grocery run.